Believers, we are the “whosoever that believeth in him”. We will not perish. We will have everlasting life. I imagine all of us have seen, read and even memorized this verse, but today let’s just focus on what it is saying and give great thanks that we serve a God that loves so greatly that He offered His only Son to die for us. Let’s give great thanks that we believed and received God’s great gift of salvation thru His Son Jesus Christ. 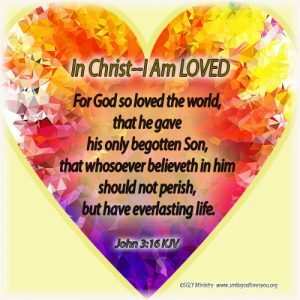 Let’s give great thanks that we, now in Christ, will not perish in our sins, but we will enjoy everlasting life in heaven with God our wonderful Father who loves us and with Jesus Christ, His Son, our Savior. Rest in His Love today!